Maine Asylum-Seeker Fights For His Right To Poetry Allan Monga won Maine's Poetry Out Loud competition last month, but the NEA barred him from the national stage because of his immigration status. Now he's suing for his right to participate. 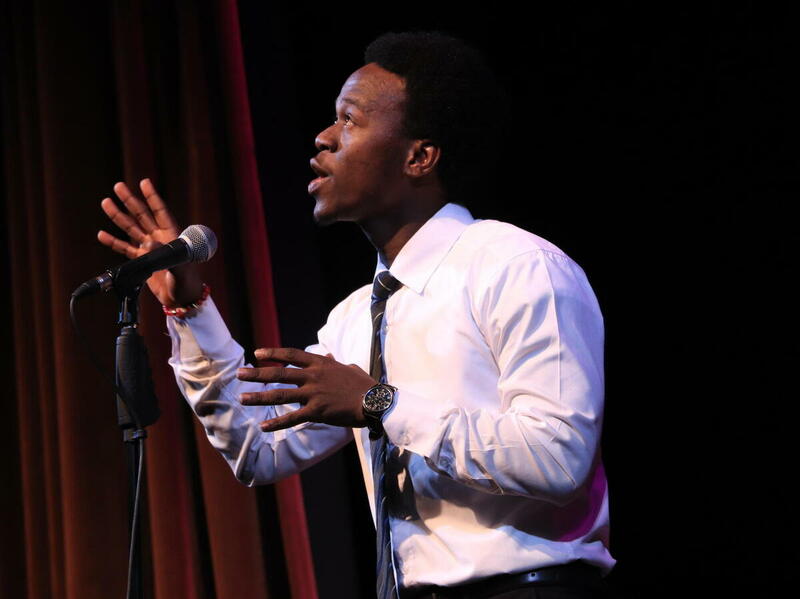 Asylum-seeker Allan Monga, 19, won Maine's Poetry Out Loud competition in March. But he's been barred from the national competition because he's not a citizen or permanent resident. 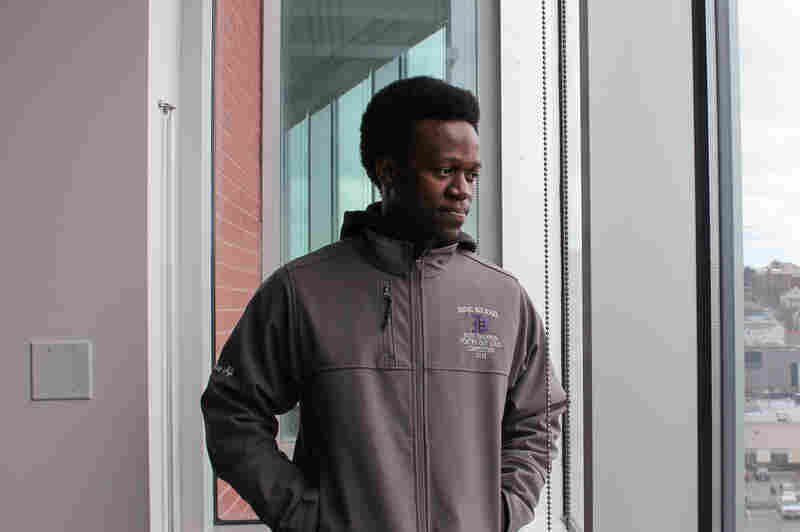 Allan Monga had never given much thought to poetry before last summer, when he arrived in Maine as an asylum-seeker from Zambia. At the time, he was almost completely alone, living at a teen shelter in Portland and nervous about speaking with anyone in his new country. "It was really hard for me," says Monga, 19. "I didn't really know anyone. It was hard to trust anyone." In the fall, he enrolled as a junior at Portland's Deering High School. His English teacher played a video in class promoting something called Poetry Out Loud. It's a nationwide competition, organized by the Poetry Foundation and National Endowment for the Arts, where students memorize and recite poems. The top finishers can win cash - and money for their school to buy more poetry books. Monga started picking out poems and reciting them for teachers and friends. That was when he realized that the language of poetry could help him find his voice in his new home. One work really struck him: W.E.B. Du Bois' 1907 poem, "The Song of the Smoke," which he chose for his performance at Maine's Poetry Out Loud state finals in late March. I am black! I am darkening with song, I am hearkening to wrong! In a video of his performance, Monga bellows the poem, puffing out his chest as he enunciates each syllable. I will be black as blackness can. The blacker the mantle, the mightier the man! "Once I'm reciting that poem, it's like, 'Hey! Look at me! I am the Smoke King!'" Monga says. "You just have to grab everyone's attention. Everyone has to listen to you. "When I recite that poem, I feel like I'm in a position of authority and power. And everyone is listening." With that performance and two others, Monga won the state competition. But there was a hitch. Poetry Out Loud's official rules say competitors "must be U.S. citizens or permanent residents with a valid tax identification or Social Security number." Monga has a Social Security number, but he has yet to be granted asylum - so he's not a permanent resident. Deering High School successfully petitioned the organizers of Maine's competition to let Monga participate at the state level. But the National Endowment for the Arts says he's not eligible for the Poetry Out Loud national finals, which begin April 23. So Monga is fighting back. Last week, he filed a lawsuit against the National Endowment for the Arts and the Poetry Foundation, petitioning a court to allow him to compete. He says many students at his school and others are asylum-seekers like him. Wednesday morning, Monga's lawyers made their case to a federal judge that the Poetry Out Loud competition's eligibility rules are discriminatory towards asylum seekers and violate federal civil rights laws. Attorney Kaighn Smith told the judge that because the current eligibility rules exclude asylum-seekers such as Monga, they, in effect, take away his right to an education that should be open to everyone in the country. "This is very much about the realization of an education benefit," Smith said, adding that Monga worked for months and was allowed to participate in local and state competitions. "He's now been sidelined," Smith said. During the hearing, U.S. District Judge John Woodcock appeared sympathetic to Monga's case. He said he understood that agencies needed to set immigration rules for specific cases, such as deciding who's allowed into the country. But he repeatedly asked the NEA to explain why restricting eligibility to a national poetry competition would be "in the national interest." Lawyers with the NEA say the agency is on firm legal ground. Rachael Westmoreland, an attorney representing the NEA in court, said the agency is only provided with limited funding from Congress. In deciding who receives those funds, Westmoreland said the agency is permitted to "draw a line" based on certain characteristics of immigrants, such as how long they've been in the country. "It's in the national interest to give the limited resources of the federal government," to those who've been in the country legally for an extended period of time, Westmoreland told the judge. Westmoreland also pointed to several other longstanding national programs with similar eligibility requirements, such as grants from the National Science Foundation, requiring that recipients be "citizens, nationals or lawfully admitted permanent resident aliens of the United States." An agency spokesperson says the NEA won't comment on pending cases. The Poetry Foundation argued in court that it's not subject to the same federal anti-discrimination laws as the NEA because it doesn't receive federal funds. Monga's case has received substantial support locally. Elected officials, including Maine Congresswoman Chellie Pingree, have asked the National Endowment for the Arts to reconsider its decision. And Portland Public School administrators have fought for Monga since they discovered the eligibility rules excluding him in early March. The district has joined Monga in his suit. "Allan has huge potential," says Portland Public Schools Superintendent Xavier Botana. "For us to just stand down and not let him realize that, because of some rule that we don't think is legally correct, but is also just morally wrong — it's a no-brainer." For now, Monga says he's still practicing with his teachers and preparing as if he's headed to the national finals. But he says if the judge doesn't rule in his favor, he'll be disappointed - not just for himself, but for other asylum seekers who may want to participate in future competitions. "I don't want the other kids to go through what I'm going through right now," he says. Judge John Woodcock indicated that he would issue a decision by the end of the week. The national finals of Poetry Out Loud begin Monday, April 23.